Located on the north of India, 365 meters above the sea-level, on the foot-hills of Shivalik range, is the city beautiful,'Chandigarh'. It is the capital of two States of the Indian Union, namely, the Punjab and Haryana.Though it is the capital of two states, it belongs to none of them and is a Union Territory Before the partition of India, on August 15, 1947, the areas which are now parts of the Punjab, Haryana, Delhi, some parts of Himachal Pradesh and some areas falling in West Pakistan, formed the Punjab. Lahore was its capital. 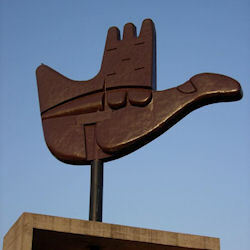 Open Hand- the official emblem of Chandigarh-stands in metal beside the High Court. It signifies that the city is "Open to give; Open to receive"
In the partition, Lahore was given to Pakistan. There arose the need to have a new capital for the areas of the Punjab that had fallen to India.In March, 1948, the Government of Punjab in consultation with the Government of India, approved a 114.59 sq.km. tract of land at the foot of the Shivalik Hills in Ambala district, as the site for the new capital. Le Corbusier, a well-known, French architect, was chosen to execute the project. India's first Prime Minister, Jawaharlal Nehru, enthusiastically supported the project and took sustained interest in its execution. When he visited the project on April 2, 1952, he declared Let this be a new town symbolic of the freedom of India, unfettered by the traditions of the past, an expression of the nation's faith in the future....The new capital of Punjab will be christened as Chandigarh - a name symbolic of the valiant spirit of the Punjabis. Chandigarh is rightly associated with the name of Goddess Chandi -Shakti, or power. Situated at a distance of about 240 kilometers on the north of Delhi on National Highway No.21, it is connected by bus, rail and air. Chandigarh is known all over the world for its being the first planned Asian city. The City is divided into well-planned and defined sectors. Each sector is a separate self-reliant unit, having all the essential amenities, such as, school,dispensary, post office, market etc. The City also boasts of open parks and wide roads. Being the capital of the two states, the administrative headquarters of both the States are also located here. Many people from other parts of India and the world visit it every day to see the architecture of its buildings. Zakir Rose Garden, Rock Garden and Sukhna Lake are some of the places of interest in the city. It is also the seat of the High Court of the Punjab and Haryana. The High Court is located in Sector 1 of Chandigarh. After the partition of India, the Constitution of India was framed. However, before the partition, there was the Government of India Act, 1915. By virtue of the powers conferred by Section 113 of the Government of India Act,1915, the Crown by Letters Patent dated March 20, 1919 had established at Lahore, the High Court of judicature for the provinces of Punjab and Delhi to be called 'the High Court of judicature at Lahore'. The High Court of judicature at Lahore was a court of record. 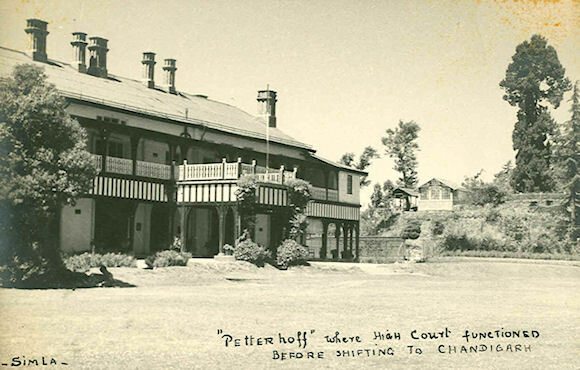 The East Punjab High Court of judicature was established at Shimla on August 15, 1947 by the Governor General's High Court (Punjab) Order 1947 issued under Section 9 of the Indian Independence Act, 1947. In exercise of the powers conferred by Section 229 (1) of the Government of India Act, 1935, the High Court of East Punjab was also made a court of record and as provided by Clause 5 of the said order, it had in respect of the provinces of Punjab and Delhi, all such original, appellate and other jurisdictions as under the law in force immediately before the August 15, 1947, was exercisable in respect of those territories by the High Court at Lahore. 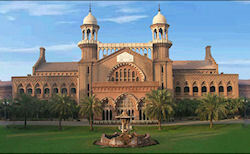 The East Punjab High Court was the successor and continuation of the High Court at Lahore. The decisions of Lahore High Court were binding on the Punjab High Court on the principle of stare decisis. 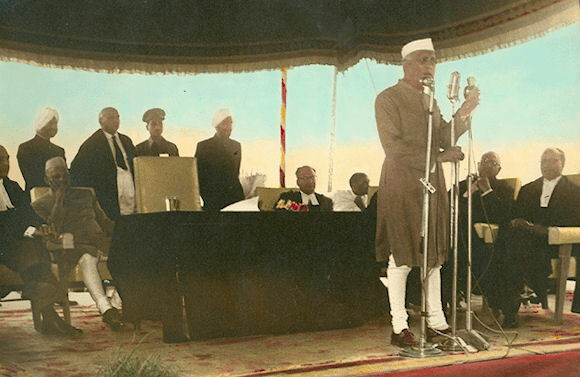 The Constitution of India came into force on January 26, 1950. The State of East Punjab came to be known as the Punjab now. Accordingly, the name of the High Court was also changed. As per Article 214(2) of the Constitution of India, the High Court was to be continued along with other High Courts. The Constitution of India also conferred on the Punjab High Court, along with all other High Courts, the power to issue directions, orders including writs in the nature of habeas corpus, mandamus, prohibition, quo-warranto and certiorari in the enforcement of fundamental rights or for any other purpose. The East Punjab High Court did not have the power to issue writs. However, the seat of the High Court continued to remain at Shimla. However, it was formally declared open by the first Prime Minister of India, Pandit Jawahar Lal Nehru, on March 19, 1955. The plan of the building of the High Court was designed by the world famous French Architect, 'Le Corbusier' under the exuberant guidance of Hon'ble the then Chief Justice, Mr. Justice A.N. Bhandari. There existed the Patiala and East Punjab State Union (Pepsu) along the State of Punjab, which had also its own High Court known as 'Pepsu High Court'. However by the States Re-organisation Act, 1956 the State of Pepsu was merged in the State of Punjab. The Judges of the High Court of Pepsu became Judges of the Punjab High Court. The strength of the Punjab High Court, which had originally 8 Judges rose to 13. The Punjab High Court also assumed jurisdiction over the territories which were earlier under the Pepsu High Court. There existed a Bench of the Punjab High Court at Delhi since 1952, which was installed by the Governor General under the power conferred on him by Clause 33 of the Lahore Letters Patent. However, a separate High Court was constituted for the Union Territory of Delhi under the Delhi High Court Act, 1966. Three Judges of the Punjab High Court were transferred to Delhi High Court. The High Court of Punjab also ceased to exercise jurisdiction in respect of Union Territory of Delhi from October 31, 1966. All the cases arising within the jurisdiction of Delhi High Court were transferred from the Punjab High Court to the High Court of Delhi. A new chapter opened in the history of the High Court in the year 1966. The States Re-organisation Act, 1966, brought another State named Haryana and the Union Territory of Chandigarh into existence from November 1st, 1966. From the date of enforcement of the said Re-organisation Act, the High Court of Punjab was renamed as 'the High Court of Punjab and Haryana'. The Judges of the High Court of Punjab became Judges of the common High Court with all the powers and jurisdiction of the High Court of Punjab. However, the principal seat of the High Court remained at Chandigarh. The High Court of Punjab and Haryana is working since November 1, 1966 in its present form. It is one of the most beautiful High Courts in India with 40 spacious and luxuriously furnished courtrooms; 3 Bar rooms; a well-equipped Judges' library, a dispensary and a very good canteen. Its location in the lap of Himalayas beyond the limits of the city, beside Assembly Hall and Sukhna Lake add to its beauty. The sanctioned strength of the High Court is 38 permanent and 30 additional Judges. The High Court completed 50 years of its existence on March 19, 2005. Accordingly, the year 2005-2006 was celebrated as Golden Jubilee Year of the High Court. Many functions were held to commemorate the event. However, the main function was held on December 10, 2005 in the premises of the High Court. 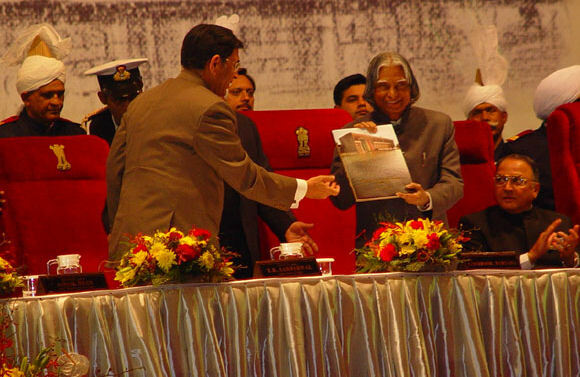 His Excellency, the President of India, Mr A P J Abdul Kalam was the chief guest of the function. The Chief Justice of India, Hon'ble Mr Justice Y K Sabharwal; other Supreme Court Judges; Hon'ble Judges of Delhi High Court, Himachal Pradesh High Court, Lahore High Court and former judges also attended the function. Hon'ble Union Law Minister, Mr H R Bhardwaj; His Excellency, Mr S F Rodrigues, Governor of Punjab; His Excellency, Mr A R Kidwai, Governor of Haryana; Chief Minister of Haryana, Mr Bhupinder Singh Hooda; Deputy Chief Minister of Punjab, Mrs Rajinder Kaur Bhattal were other dignitaries, who participated in the function.> A souvenir was also released on the occasion. The State Governments of Punjab and Haryana also hosted special dinners in honour of guests. On that very day, Hon'ble Chief Justice of India also laid the foundation stone of the State Judicial Academy, at Sector 43, Chandigarh. The Chief Justice of the High Court formally closed the Golden Jubilee celebrations on March 18, 2006. An exhibition was opened on that day. It was inaugurated by Mrs. Padma Bhandari, wife of Hon'ble Mr. Justice A N Bhandari, who was the Chief Justice of the Punjab High Court in the year 1955, when the High Court had started functioning from the present building. Conceived by a committee comprising Hon'ble Mr. Justice M M Kumar, Hon'ble Mr. Justice Hemant Gupta; Hon'ble Mr. Justice S S Saron; Hon'ble Mr. Justice Rajive Bhalla, Hon'ble Mr. Justice S N Aggarwal, the exhibition drew crowds and was a great success. The exhibition remains open on all days except Sunday. The entry to the exhibition is free.